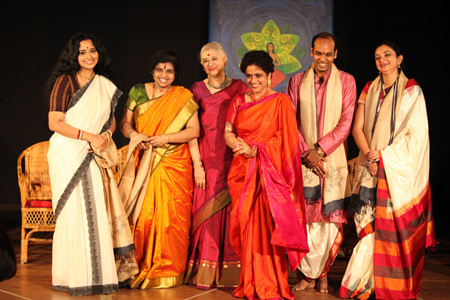 The Natya Kala Conference on its fifth day gains momentum and throws light on some more facets of dance as a profession. Convenor Dr Ananda Shankar Jayant expresses her gratitude to Padmini Chettur for stepping in the last minute, as Kumudini Lakhia was unable to attend the conference. Convenor Dr Ananda Shankar Jayant had made a prior announcement on the inaugural day, that due to the present conference shortened by one day, four daily sessions were included instead of three, so as to sufficiently address the broad issues of this year's theme, "Dance Matters!" Some speakers chose not to take questions and continued their presentation for the entire 50 minutes slot aloted to them. Hence, questions could not be entertained due to lack of time. Padmini Chettur's post-modern approach to dance traces back to her rigorous training in Bharathanatyam and a decade of working with Chandralekha. "Yoga, Kalaripayattu, and Bharathanatyam formed the basis of Chandra's compositions. When I needed to take my dance further, I found my training in Chandralekha's vocabulary was already exhausted. There was an urge to unlearn and put the body in a neutral position to develop a dance vocabulary and to understand gravity, rhythm, and emotion afresh," says Padmini, who in the early 90s began her solo journey and thought she could dance for expression of self only to realize a decade later that her dance cannot cope up with the politics and reality of life. Here is where she emerges with a newer form with a process of deconstruction and abstraction. "What is generally practiced as contemporary dance with classical dancers picking up from a mix offorms to create a fusion vocabulary was a complete NO for me! At the same time, my dance had to emerge as dance art amidst the strict classical forms on one hand and those popular, filmy entertainment dances of Shamik Davers on the other...," continues Padmini Chettur. 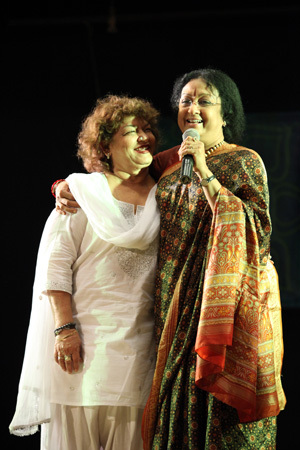 Though the conservative critics among the audience did not appreciate the videos of her productions, there were dancers like Uttara Asha Coorlawalaincluding this present writer, who complimented the dancer for working with honesty and in-depth research. Padmini thinks about dance fifty years down the lane and finds its position precarious for lack of curiosity... Way to go Padmini! 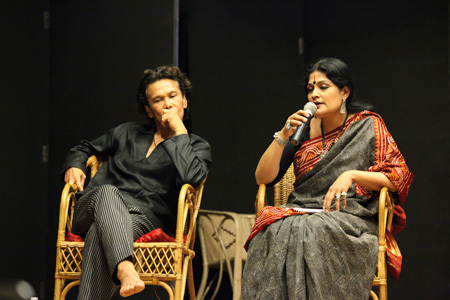 Leela Venkataraman moderated an interesting dialogue between Geeta Chandran and Ramli Ibrahim. She gave credit to these dancers who are traditionally trained in classical dance forms and are passing the same to a newer generation. At the same time, they have been continuously pushing the envelope for their own artistic needs. "Stretching for me is furthering my artistic language. I have collaborated with puppetry and theatre artistes and have incorporated various musical forms especially Bhakti Sangeet. Many dancers, even during yesteryears, have stretched in their own right. 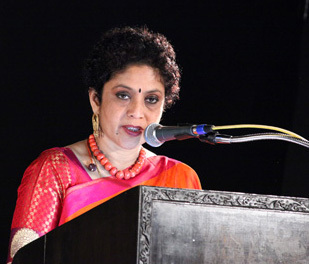 For example, Yamini Krishnamurthy stretched her solo idiom. Rukmini Devi institutionalized Bharathanatyam, along with a host of others who have been responsible for dance as it is today. And time will only tell what is in the future... " says Geeta, who is known for creating dance productions based on social issues. Ramli Ibrahim, on the other hand, showed a presentation on his Surra Dance Theatre in Malaysia. This dance institution has created a conducive atmosphere for painters, dancers, and theatre artistes to work in collaboration. "I find stretching myself really hard while working as an administrator," says the dancer on a lighter vein. Yet another stimulating dialogue came from a panel of young gurus moderated by Leela Venakataraman. She began the talk by recollecting legendary gurus and their ways of teaching like Birju Maharaj, Kumudini Lakhia, Balasaraswati, among others. Here were gurus who had newer challenges to face from an increasingly preoccupied generation. "I learned a lot by observation apart from my guru's teachings. While my own students question and seek reasons for what is being taught," says Kishore Mosalikanti. The young Kuchipudi guru tries to deal with his students as –‘they wish, while molding them in the way he wants'. Anita Guha, a Bharathanatyam guru who is especially good at teaching young children, says, "I try and make the students fall in love with dance, and I inculcate interest in them by telling stories... in fact I myself become a child in their company." Mohiniattam guru Gopika Varma adds, "I find it quite difficult to teach sringara padams and varnams to ten and eleven year olds. So I have gotten into researching child-friendly pieces that a child can relate to and also enjoy the process oflearning". Deepika Reddy, a Kuchipudi guru from Hyderabad, says, "Teaching has always been a learning experience for me.... Speaking of my students in numbers, yes, it is large. I distribute classes throughout the week. I appreciate the fact that they make an effort to come to class despite their busy schedules. What bothers me is the anxiety of the parents for arangetrams, though I strive to educate them against premature performances, which can hinder the child's proper understanding of the art form." Leela Venkataraman suggests to include dance games like theatre games while teaching dance to attract the child's interest. A concerned parent from the audience, Deepa Krishnamachari, purs in, that she is fortunate to get a guru for her daughter who has the art of retaining the child's interest in classical arts. Here comes Saroj Khan, from the world of Bollywood, into the arena of classical dance enthusiasts at the traditional Krishna Gana Sabha! Amazingly, the filmy choreographer danced her way into the hearts of the onlookers! The auditorium boomed with popular Bollywood numbers, with young dancers wearing shimmering bangles and kurtas swaying across the stage. Saroj Khan was humble in accepting praises and more than happy to take pictures with the legendary Dr Padma Subrahmanyam. Red and black were the dominant colors during the fifth day of the conference. Presenter Geeta Chandran looked stunning in a black and red batik embroidered sari. Dashing Ramli Ibrahim complimented Geeta's look with his black silk shirt and pin-striped black pants. Radica Giri was striking in an offbeat red Coimbatore silk sari with an unusual zari border with geometric patterns. Dr Ananda Shankar Jayant's gorgeous orange blouse had a unique chakra motif on the border. I must also mention that Prabha Prakash & Padma Dwarkana have been consistently stylish. These regular conference attendees have been wearing vibrant silk-cotton and Kanchipuram saris each day. Finally, Dr Sunil Kothari looked dapper in an electric blue silk shirt paired with well-fitted black slacks. Sadly, the conference ends tomorrow, but I wish you all a very Happy New Year filled with good fashion! "This marvelous conference would have been better had there been some economy in presentation. It would have given some time to refresh and recollect what was discussed. 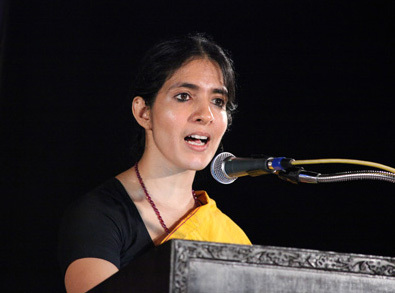 For instance, it was possible to engage in intellectual discourse during Padmini Chettur's presentation. More is less, less is more," Dr. Sunil Kothari, Senior Dance Critic, Researcher, & Scholar from New Delhi. 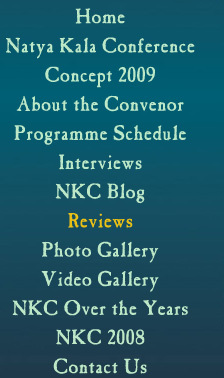 ''As someone trying to pursue dance as a profession, the conference is absolutely informative. It is interesting to see dance in its many contexts, and not just looking at it from the traditional and contemporary perspectives. Also, the decorations are beautiful, especially the paintings," Rohini Acharya, Young Dancer from Los Angeles, U.S.A.
"During the panel with young gurus, I felt like someone was reading my thoughts and putting them into words. The best part of the conference was that 1 got to meet so many different people from the field of dance, and converse with them about the season," Janaki Rangarajan, Dancer & Teacher from Washington D.C., U.S.A.
''All the issues that were brought up today regarding teaching and performance are exactly the same as those we are dealing with in the United States. The students lack focus, but they are much faster at picking up movements. Grasp of technique has certainly increased from the past, but has artistry increased?" Patrick Suzeau, Dance Professor from Lawrence, U.S.A.
"I found that the present convenor has increased the scope of the conference and covered natya at its fullest by gathering a tremendous variety of dance styles on stage," Deepa K., Art Connoisseur from Hyderabad.